Home / Stock Picks / Dividend Stocks / Wells Fargo & Co (WFC) Stock Was Saved by Trump, But Will It Last? Wells Fargo & Co (WFC) Stock Was Saved by Trump, But Will It Last? Whether they want to admit it or not, several companies have benefited from President Donald Trump. Often outrageous and almost never soft spoken, “The Donald” has his fair share of critics, to say the absolute least. As such, I don’t blame any corporate executive for distancing their organization from the president. But if there’s one firm that has an obligation of loyalty, it is Wells Fargo & Co (NYSE:WFC). 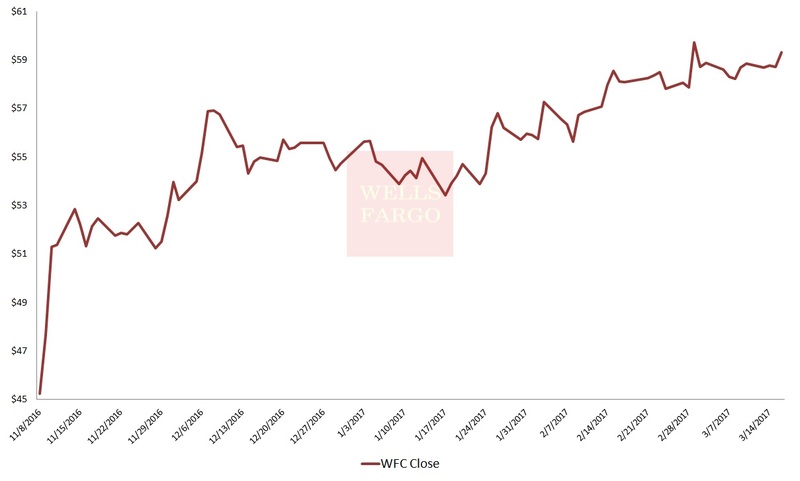 At the beginning of last year, WFC stock was just like its competitors among the “Big Four” banking institutions. It suffered terrible volatility in January, followed by a rocky and somewhat sideways recovery. However, the back-and-forth of WFC and the major bank stocks was quite understandable. We were in the midst of a calamitous election cycle, one which we will thankfully never see again (after 2020). But that was before what Wells Fargo might consider “Black September.” Executives fessed up to the fact that some WFC employees created more than two million fake accounts to meet lofty sales targets. In and of itself, that action is unforgivable. We trust these big bank stocks with our livelihoods and our futures. Worse yet, Wells Fargo earned the title of “cleanest shirt in the dirty hamper,” according to InvestorPlace contributor Richard Saintvilus. Additionally, WFC was accused of violating the Servicemembers Civil Relief Act by repossessing soldiers’ vehicles. Whatever the actual details, the optics were horrific for the general public. To no surprise, WFC stock tanked in the markets. Many analysts wondered whether this was it for Wells Fargo. Then, the miracle of Donald Trump materialized. The Big Four bank stocks received an unprecedented reprieve. 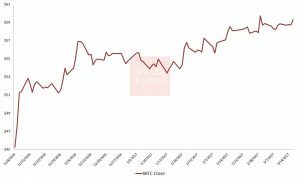 JPMorgan Chase & Co. (NYSE:JPM), Citigroup Inc (NYSE:C), and Bank of America Corp (NYSE:BAC) saw a huge lift in their market value post Nov. 8 through the end of December. Click to Enlarge But WFC stock was indisputably the “bigliest” winner of them all. Granted, we’re not talking strictly about the numbers. The bank stocks minus Wells Fargo averaged a Trump-inspired 24%. WFC stock only registered 21%. That was far below the first-place ranking of BAC at 30.5%, and it didn’t even qualify for second (JPM at 23%). Still, the beleaguered bank won because it didn’t lose. Last September, WFC stock shed more than 12% in the markets. The other three major bank stocks averaged a 1% loss. That is a massive differential in volatility, particularly within the exact same sector. It was then that the possibility of the “Big Three” bank stocks lingered ominously. Now, the future looks bright for Wells Fargo and WFC stock. President Trump is working on his promise of lower regulations for multiple industries, including high finance. Furthermore, the economic engine seems to be firing on all cylinders. The most recent jobs report exceeded all expectations, bolstering hopes that Trump can at least deliver bipartisanship through the economy. If anything, WFC benefits from Twitter Inc (NYSE:TWTR) and ironically, the Wag the Dog effect. Whatever controversies Wells Fargo generated, it’s now swept under the rug thanks to Trump’s incessant need to open his mouth. So does that mean investors should buy into WFC stock? To be blunt, no. I don’t hate WFC stock, so I wouldn’t recommend shorting it. Clearly, the economic fundamentals are loving “The Donald.” The markets, as well as private businesses, are appreciative of proposals to amend onerous tax laws. And as previously mentioned, looser regulations will go a long way in making American companies competitive again. Those key factors, as well as many others, will support the bull case for WFC stock. But the sticking point is this: why risk your money on Wells Fargo when the other three bank stocks will do just fine or even better? The news cycle is dominated by Donald Trump and the Russians. But that doesn’t mean that what Wells Fargo did can be erased completely. While other bank stocks can possibly enjoy the fruits of Trump’s “labor,” WFC will have to face the music. Americans are forgiving, but they’ve been burned before by big institutions. In consideration of this dark cloud, the recent performance of WFC stock is disappointing. BAC is the clear winner since the election, up nearly 37%. Citi is the laggard at 16.6%, whereas JPM is at 24.2% and Wells Fargo is at 20.9%. Here’s the thing — BAC and JPM didn’t create fake customers. Wells Fargo did. Knowing that that could come back to haunt WFC stock, I want to see much more growth. So far, Wells is not delivering, and therefore, I’m not buying. Article printed from InvestorPlace Media, https://investorplace.com/2017/03/wfc-stock-saved-trump-will-last/.